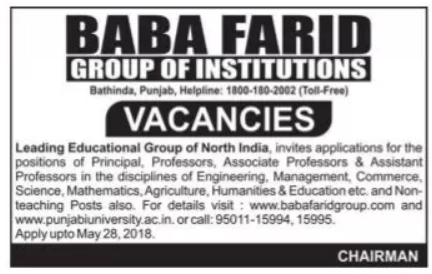 Baba Farid Group of Institutions, Bathinda has advertised in the TRIBUNE newspaper for recruitment of Teaching Faculty- Professor / Associate Professor / Assistant Professor / Principal jobs vacancies. Interested and eligible job aspirants are requested to apply upto 28th May 2018. Check out further more details below. About College: Baba Farid Group of Institutions, incepted in the year 1993 under the guidance of Baba Farid Vidayak Society, is one of the prominent education hubs in India. Found, led and managed by reputed educationist Dr. Gurmeet Singh Dhaliwal (Chairman), the institution is delivering the academic excellence with complete panache. Being the Leading Educational Institute of the Region, it is a preferred destination of Indian and international learners to attain their career goals.